The Super Bowl is the most widely watched event on American television. This year the opponents in Super Bowl XLVII are the Baltimore Ravens vs. the San Francisco 49ers. As a sporting event, nothing compares to the Super Bowl in American sports. It is a two week media extravaganza. Every Super Bowl has its storyline. This year there are some interesting ones. Jim and John Harbaugh are the respective coaches of the teams and this is the first time that brothers will face off against each other in the Super Bowl. Ray Lewis, the star linebacker and sure fire Hall of Famer from the Baltimore Ravens is retiring. The Super Bowl will be his last game. He’d like to cap his career with a second Super Bowl victory. 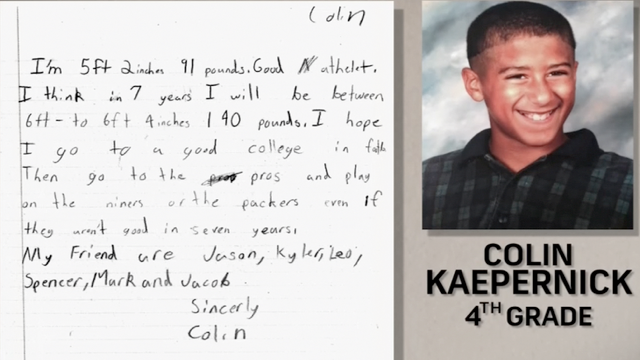 Colin Kaepernick, the starting quarterback for the San Francisco 49ers, also has a special story to tell. When Kaepernick takes the field it will be only the 10th time he has started a professional football game. Only two quarterbacks have had less experience as a starting quarterback in Super Bowl history. Kaepernick was drafted in 2011 and was a backup to Alex Smith until Smith was injured in 2012. Kaepernick took over for Smith and has been the starting quarterback ever since, a story reminiscent of Wally Pipp and Lou Gehrig. Kaepernick was born in Milwaukee, Wisconsin. He is of mixed race (African American and European) and was adopted as a child by Rick and Teresa Kaepernick. He excelled in all sports and was a star baseball, basketball, and football player. Football was his favorite sport but baseball was his best sport. He was a two-time all-state baseball player in California and received a number of scholarship offers to play college baseball. But Kaepernick wanted to play football. Rather than accept the baseball scholarships, he decided to accept a football scholarship to the University of Nevada. Nevada was the only university that offered him a football scholarship. In 2009, Kaepernick was drafted by the Chicago Cubs to play baseball but he elected to pursue a career as a football player. Kaepernick was a 6’4”, 170lb string bean and there was some concern about whether he had the size to play big-time football. He started off as a redshirt freshman, but when the starting quarterback was injured, Kaepernick was inserted into the starting lineup and never looked back. He completed the season and was named the 2007 Western Athletic Conference Freshman of the Year. In 2008, he became just the fifth player in NCAA history to pass for 2,000 yards and rush for 1,000 or more yards in a single season and was named the WAC Offensive Player of the Year. In 2009, he became the first player in NCAA history to record back-to-back 2,000/1,000 yard seasons. In 2010, he was the first player in NCAA history to have over 2,000 yards passing and 1,000 yards rushing for three consecutive seasons. Kaepernick is the only quarterback in the history of Division I FBS college football to have passed for over 10,000 yards and rushed for over 4,000 yards in a collegiate career. He graduated with a bachelor’s degree in business management and is a member of Kappa Alpha Psi fraternity. Kaepernick was drafted by the 49ers in the second round of the 2011 NFL draft. In 2012, a quarterback controversy ensued when Coach Jim Harbaugh inserted him into the starting lineup. Alex Smith had just led the team to the NFC championship game and was the third-ranked quarterback in the league when he was injured. Just like in his college career, once inserted into the starting lineup, Kaepernick never looked back. In his first playoff game, Kaepernick set an NFL single-game record for most rushing yards by a quarterback with 181. He’s made it through college and is a star in the NFL for the San Francisco 49ers fulfilling a dream that began in the fourth grade. On Super Bowl Sunday, he can add champion to his list of accomplishments. Maybe he’ll commemorate it with a tattoo of himself kissing the bicep of one arm while holding the Super Bowl trophy in the other.